This scalloped potato recipe was an instant hit. I used Lancashire White Cheese instead of the cheeses listed and it was great. Use any cheese that strikes your fancy. A great opportunity to try something new. There are 19.6g net carbs, 6.1g protein and 9 Weight Watchers points per serving. In a small saucepan combine the cream, butter, and garlic. Bring to a simmer. Remove from heat. Stir in thyme, salt and pepper. Set aside. Scrub the Russet potatoes and sweet potatoes and slice potatoes about 1/8 inch thick. Bring a large pot of salted water to a rolling boil and boil potato slices for 5-7 minutes till slightly soft. Drain and set aside. Butter a 13x9x2-inch ceramic or glass baking dish. 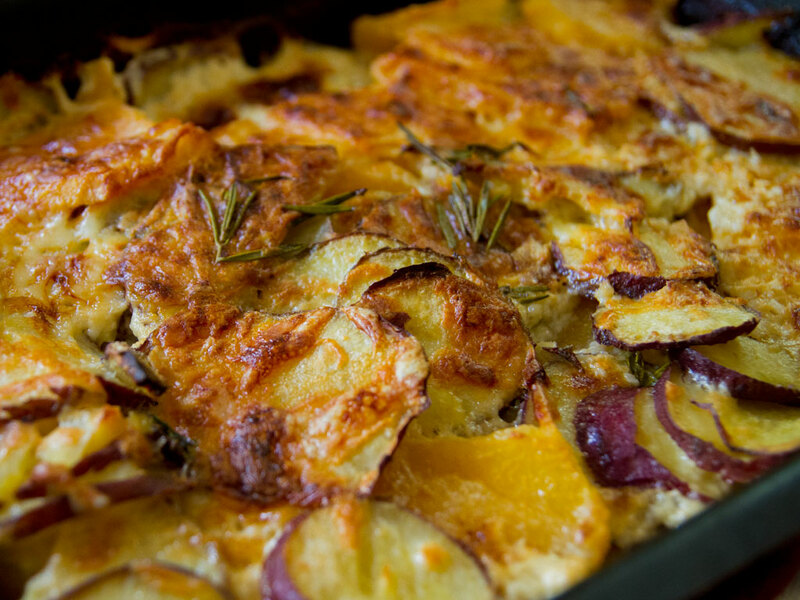 Place a layer of the Russet potatoes in the dish, followed by a layer of sweet potatoes. Repeat with remaining potatoes and cheese. Pour cream mixture over gratin. Using a spatula, press gently to submerge potato mixture as much as possible. (180C) Cover tightly with foil. Bake 35 minutes. Uncover; bake until top is golden and most of liquid is absorbed, about 30 to 35 minutes longer. Let stand 15 minutes before serving.